It was a typically busy Monday at The Cotton Patch but I managed to squeeze in enough time to quilt my Sizzix quilt "Posh Birds". 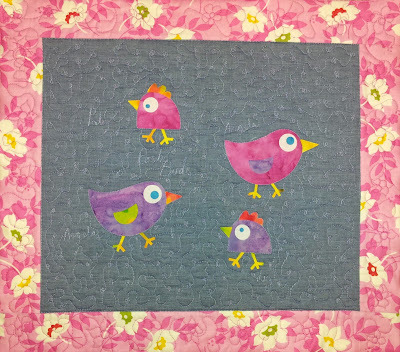 Using Superior Threads King Tut for a trailing bee quilting line with a few subtle names en route and a pink Superior Threads Masterpiece on the border with a free motion trailing flower. Pat is going to put it in a frame so I just finished off the edges with a satin stitch to hold it in place. Great fun to do and only two hours from start to finish. 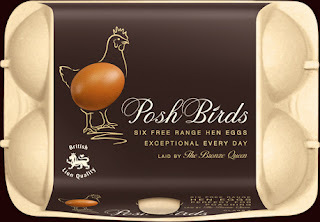 And here is the link to our inspiration - Posh Birds eggs. Delicious! The chickens are so cute! Simple but cute! Mind if I try this?